Treating with an anti-ethylene product shortly after harvest can also reduce geotropic bending of the stems when they are placed horizontally for storage and/or transport. Harvest when flowers on the lower 1/4-1/3 of the spike are open. Another author states that they should be purchased when at least two to five flowers are open per stem. Member of the Scrophulariaceae (figwort family). Native to Southwestern Europe and the Mediterranean region. Common relatives include foxglove, veronica, penstemon and calceolaria. Flowers are tubular, 1/2 long with rounded upper and lower petals. Stems leafy, 24-36 inches long. Slight fragrance, depending on cultivar. Store at 32-34 F, 1-2 weeks in water, longer in floral preservative. Best if stored dry. When stored wet, flower color will be better if they are exposed to some light in the cooler. Also, upright storage is preferred so as to reduce stem bending. Flowers stored at 32F for 5 days lasted 11 days in a vase compared to 6 days for those stored at 45F. In another study, flowers were held dry at 31F for 6 weeks with little loss in vaselife. 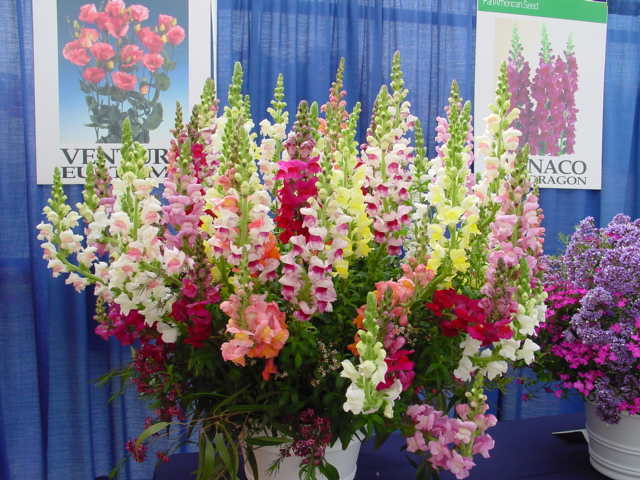 Called a “calve”s snout” for the flower”s snout-like shape, the botanical name Antirrhinum is Greek for “like” and “nose.” The specific epithet name majus means large. Favorite flowers in the earliest English gardens, research indicates that snapdragons were grown more for their beauty than for their medicinal usefulness. When grown as a garden plant, treat them as annuals although some may respond as perennials depending on cultivar and climate. The flower can be made to snap shut after separating and releasing the two-lipped corolla (united petals). The American Academy of Allergy, Asthma and Immunology lists this species as an allergy-safe pollen producing plant. Some references say removal of the top bud helps to deter the stem’s geotropic bending. Suitable for drying. Do not remove more leaves than needed as this can stimulate flower fall. Many species in this 3000 plus species family are grown for ornamental and medicinal purposes including slipperwort, speedwell, mullein, bearded-tongue, foxglove, snapdragon, toadflax, monkey-flower, cape-fuchsia, coral-plant, nemesia, and blue-lips. The common snapdragon for gardens with winter protection may remain perennial in all but the coldest parts of the country. Short-lived cultivars have from 40-110% (~400,000-1,000,000) more stomata per flowering stem than long-lived ones. Ichimura (1998 & 1999) showed that both flower food and anti-ethylene treatments greatly extend vaselife. Philosoph-Hadas et al. (1995) showed that chemicals added to postharvest uptake solutions that control calcium levels can inhibit or greatly reduce geotropic stem bending when they are laid horizontally. However, at the time of this writing such a product is not yet commercially available. Treating flowers with 5 or 10% carbon dioxide for 1 day inhibited the effects of subsequent ethylene treatments as efficiently as MCP (St. Hill and Murr, 1999).